A wide range of testosterone replacement therapy (TRT) products containing different active ingredients have been made available by a large number of both global and local manufacturers. With various studies estimating the number of men affected by hypogonadism (testosterone deficiency) at 30% worldwide, the demand for TRT is poised to increase gradually in the years ahead. The condition primarily affects men aged between 40 and 79 years, making this demographic a key target segment for market players. However, the market is currently at a crucial juncture with top performing products losing their patents in the next few years. This will no doubt cause a major dent in revenues of key market players. However, some of this impact could be reduced by the heightened demand for and awareness levels about the benefits of advanced TRT products. Many of these products are now being utilized in testosterone deficiency treatment are likely to support market growth during the forecast period. 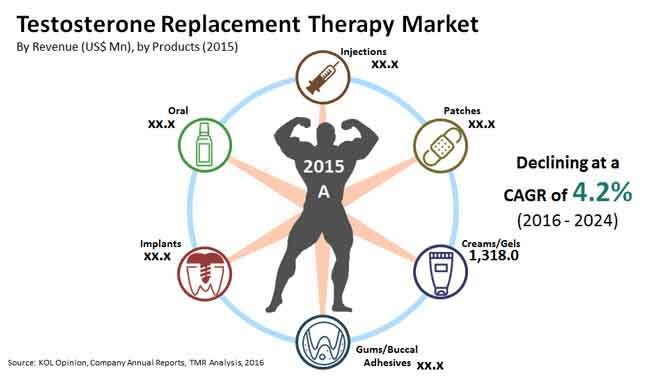 For the purpose of this study, the global testosterone replacement therapy market has been segmented on the basis of product type into creams/gels, patches, injections, gums/buccal adhesives, implants and oral drug forms. Of these, the creams/gels segment led the global market, as overall sales were mainly impelled by key branded formulations such as AndroGel from AbbVie, Inc. Axiron from Eli Lilly and Company, and Fortesta, Testim, and Natesto from Endo Pharmaceuticals Inc.
Ease of use and comparatively less side effects have been the winning characteristics of gels/cream TRT products. However, this segment is expected to lose its current hold on the market owing to patent expirations of branded formulations. TMR expects the injections product segment to witness the fastest CAGR from 2016 to 2024. This will be possible mainly because consumers are now more open to using these low priced products – a factor aided by the increasing availability of self-administered forms of these products globally. On the basis of active ingredients, the TRT market is segmented into testosterone, methyl testosterone, testosterone undecanoate, and testosterone enanthate and testosterone cypionate. Of these, testosterone as an active ingredient dominated the global TRT market in 2015. However, other active ingredients are expected to cover much ground through the forecast period. The demand for ester forms of testosterone such as testosterone cypionate and testosterone undecanoate is projected to show a healthy rise. Testosterone undecanoate is expected to witness the fastest growth through the report’s forecasting horizon from 2016 to 2024. Of the five broad geographical segments of the global testosterone replacement therapy market, North America accounted for the largest share (84.7%) of the market and was followed by Europe In 2015. The other key segments are Europe, Asia Pacific, Middle East and Africa (MEA), and Latin America. The demand for advanced TRT products was especially strong in the U.S. in 2015 as the country accounted for 95% of the North America TRT market in that year, TMR has observed. Asia Pacific will greatly benefit from higher healthcare investments being channeled into the region and is expected to witness the fastest CAGR in the TRT market during the forecast period. China and India are markets that companies in the TRT market cannot ignore. In South Korea and Japan, on the other hand, the sizeable geriatric population and strong positive sentiments will aid the consumption of TRT products. Brazil is the key TRT market in Latin America with the single largest share 2015. The key players operating in the global testosterone replacement therapy market are AbbVie, Inc., Allergan plc, Bayer AG, Endo Pharmaceuticals, Inc., Eli Lilly and Company, Kyowa Kirin International plc, Mylan N.V., Novartis AG, and Pfizer, Inc. The testosterone replacement therapy market is somewhat consolidated with presence of a few large global players and some local vendors that are operating in the international market. A range of testosterone replacement therapy (TRT) products formulated from various active ingredients are available in the market these days. At present around 30% of men worldwide suffer from hypogonadism or testosterone deficiency as shown by different studies. The percentage is substantial and in the near future it is slated to spike thereby likely effecting a demand jump for TRT products. The global market for testosterone replacement therapy is highly consolidated with the top five players accounting for a lion’s share – almost 80.0% – of the market. A report by Transparency Market Research scopes out the global testosterone market by segmenting it by product type and active ingredients. The different TRT products are avinto patches, injections, creams/gels, gums/buccal adhesives, oral drug forms, and implants. The creams/gels segment, among them, accounts for a dominant share in the market due to the robust sales of branded formulations. In terms of growth rate, however, the injections product segment is slated to outshine others with more consumers buying the products as they are relatively cheap and can be self-administered. Among the different active ingredients, testosterone holds a sway over the market but is expected to face strong competition from other active ingredients such as testosterone undecanoate and testosterone cypionate in the upcoming years. A major concern in the global testosterone replacement therapy market is the imminent patent expiration of some of the top products which will pave the way for lesser priced generics in the market. This is predicted to bring down revenues of dominant players significantly. The segment predicted to take maximum hit is the gels/cream TRT products, which now enjoys a dominant market share because of its ease of use and reduced side effects. Another factor bogging down the market is the possible risk of cardiovascular or metabolic disease resulting from the treatment of testosterone deficiency. The blow dealt by the patent expirations to the global market for testosterone replacement therapy is expected to be somewhat mitigated by the growing instances of testosterone deficiency and a burgeoning geriatric population – a key target demographic for companies. Besides, rising awareness about testosterone replacement therapy (TRT) and unveiling of innovative testosterone replacement therapy technology such as spray-on and unmodified testosterone is also expected to propel sales and offset the loss to some extent. But overall, patent expirations will drag down revenues in the long run. The report by Transparency Market Research, finds that revenues in the global market will tumble and reach US$1.3 bn by 2024 from US$2.0 bn in 2015 at a negative CAGR of 4.2% CAGR from 2016 to 2024. North America, powered by strong demand for advanced TRT products in the U.S., dominates the global testosterone replacement market by accounting for almost 84.0% share in it. In fact, the U.S. occupied about 95.0% of the North America market in 2015. Europe follows North America vis-à-vis market share. Other important markets are Asia Pacific, the Middle East and Africa (MEA), and Latin America. Asia Pacific is expected to exhibit speedy growth because of significantly higher healthcare investments. China and India hold out a solid potential for the TRT market. South Korea and Japan too will impact sales positively due to a growing population of geriatrics. In Latin America, Brazil is the primary TRT market with maximum share. Prominent players in the global testosterone replacement therapy market are Allergan plc, Novartis AG, AbbVie, Inc., Endo Pharmaceuticals, Inc., Bayer AG, Eli Lilly and Company, Mylan N.V., and Pfizer, Inc.